Nitric acid mixed with an organic solvent exploded in a university lab. Someone put nitric acid into a container previously used for methanol. Over the next 12 to 16 hours, the nitric acid reacted with the residual methanol. This created carbon dioxide and caused pressure to build up. Eventually, the container exploded. Mixing incompatible chemicals can cause serious injuries and damage to property. Learn how safe hazardous chemical storage helps avoid such consequences. Justrite supplies optional document storage boxes for safe SDS storage. Easily install boxes onto safety cabinet doors or side walls to protect important papers from moisture and dirt. It may seem obvious to store chemicals in alphabetic order for ease of use. But, this could result in storing incompatible chemicals right next to each other. Copper (II) sulfide reacts explosively with cadmium chlorate. A vigorous reaction occurs when hydrogen peroxide and iron (II) sulfide mix. Chemical groups also react with other groups. Oxidizers are not directly flammable. But, they release oxygen, a key component of the fire triangle. It is risky storing them alongside flammable materials. Safety experts suggest a systematic approach to categorizing and storing chemicals. No matter what organizational method is used for segregation, it is important to understand how these chemical groups react with one another and the associated risks. RELATED ARTICLE: What Should Be Stored in a Flammable Storage Cabinet? Don’t store chemicals in alphabetic order. Use shelf dividers and clear labeling for organization. Simple housekeeping and order goes a long way toward preventing human error, such as placing the wrong chemical in the wrong place. Only store hazardous chemicals in an approved flammable safety cabinet. Look for FM and UL approvals. These certify the cabinet meets OSHA and NFPA standards. Never store cardboard boxes in a flammable safety cabinet. Cardboard and paper may get saturated with flammable materials from spills and leaks. This creates a major fire risk. Always store flammable materials in a flammable storage cabinet, even if the chemical has other hazards. For example, aldehydes are both flammable and toxic. But, flammability trumps toxicity. Store aldehydes in a flammable storage cabinet. Secure it to prevent unauthorized access. Use clear signage on safety storage cabinets to identify its contents. 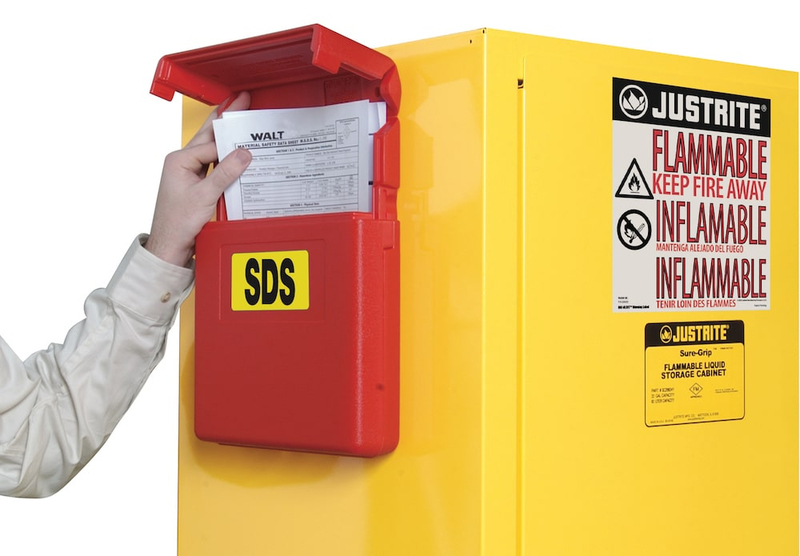 Justrite safety cabinets feature exclusive Haz-Alert™ warning labels that inform all workers and first responders of its main chemical hazard – FLAMMABLE, ACID or HAZARDOUS. Justrite safety cabinets also come with a pack of 10 standard labels to identify specific contents. Never keep bottles of chemicals in a fume hood. Vapors from unsealed bottles could react with other chemicals in the fume hood, causing an explosion. 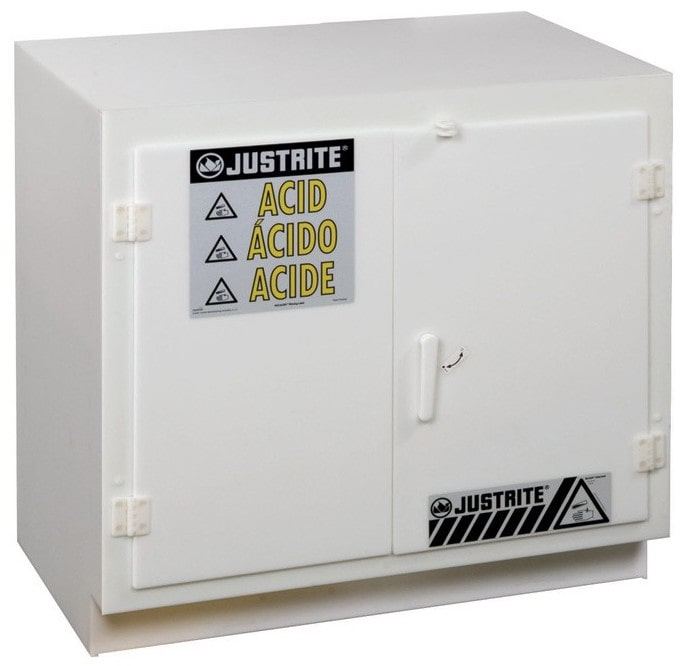 Use Justrite under fume hood safety cabinets instead – both flammable and corrosive options available. Store non-flammable corrosive chemicals in polyethylene cabinets, such as a Justrite Polyethylene Corrosive and Acid Cabinet. These have no metal parts, since even corrosive fumes cause rust and reduce the life of your cabinet. 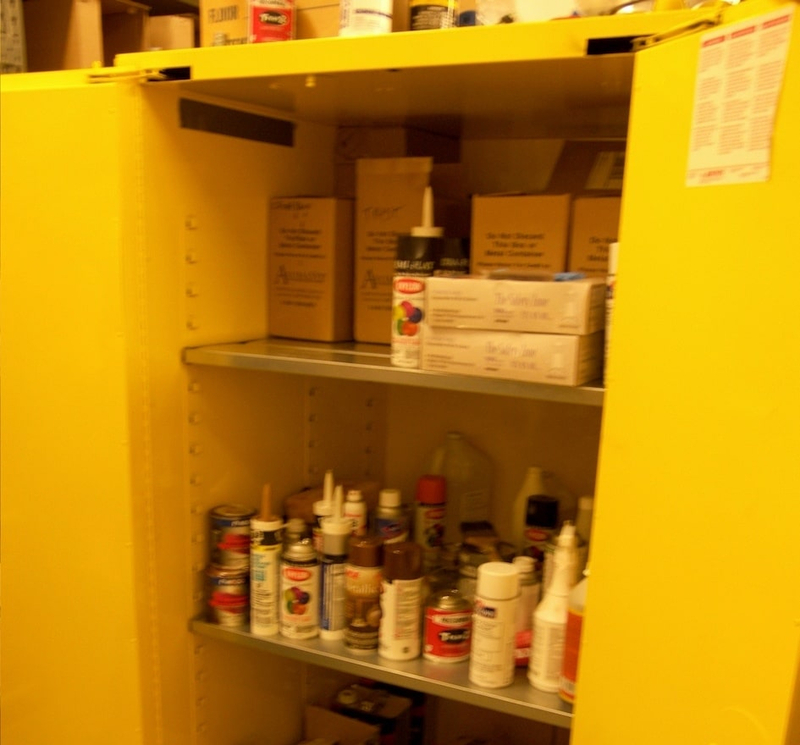 Wooden laminate cabinets with a laminate finish are also suitable when storing corrosives. 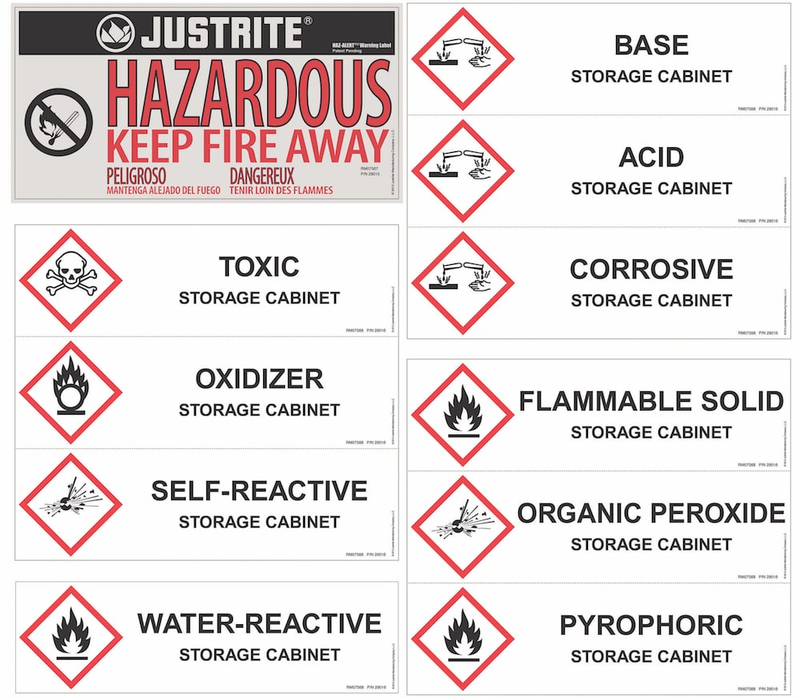 Justrite specializes in flammable and hazardous chemical storage solutions. 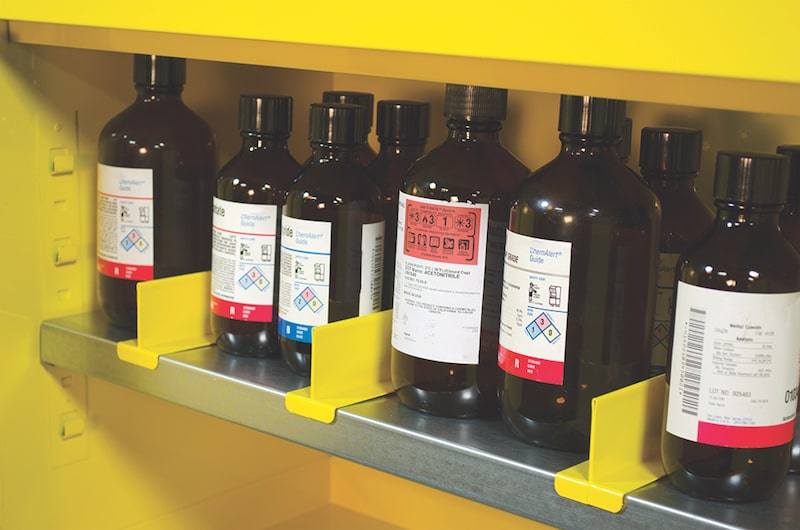 We offer a wide range of products for laboratory environments, including cabinets for corrosives and hazardous materials as well as safety containers for dispensing and HPLC disposal. All products meet and exceed codes and regulations. Browse all our safety cabinets or contact us to discuss your chemical segregation and storage needs.